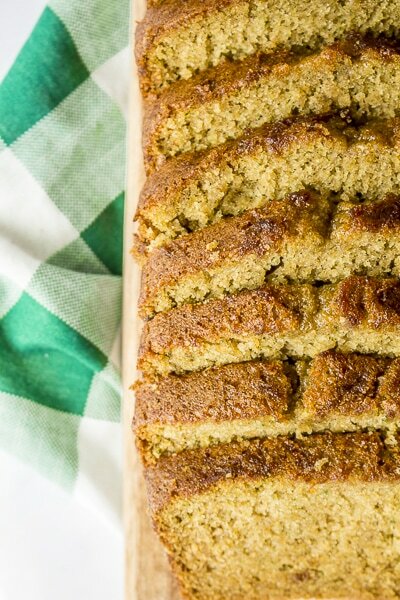 This is The Best Zucchini bread you will ever eat. It also happens to be the easiest zucchini bread you’ll ever make. Win-win! No grating required in this recipe, simply toss the ingredients in your blender and voila! Gluten Free Blender Zucchini bread. This post may contain affiliate links, please see full disclosure. 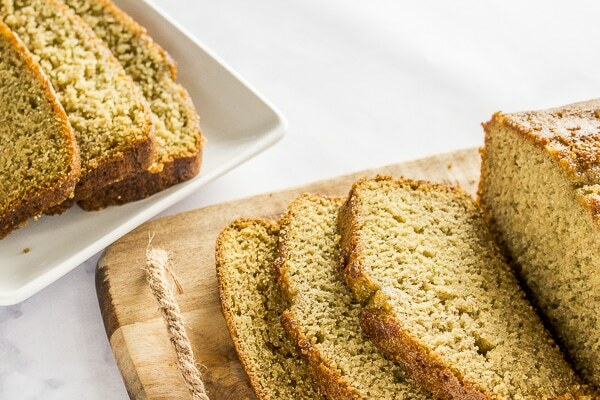 Zucchini bread is a long standing favorite of mine, and years ago a friend introduced me to one of the most revolutionary ideas of all time (really): Making zucchini bread…in a blender. As you allllll know, I’m a sucker for time-savers, and this one also doubles as a way to make this bread super soft packed full of that wonderful zucchini flavor. It’s a game changer for sure! Many years ago (before I started the Life After Wheat blog), I met a sweet lady through my son’s preschool. We had quite a lot in common…we both loved to be in the kitchen, and we both also had a child with special needs. Sometimes while volunteering at the school we would chat, and I don’t remember how zucchini bread came into the conversation that particular day, but she told me about her recipe. I was intrigued that the recipe called for blending all the ingredients instead of grating the zucchini, and she brought her recipe to share with me the next time we saw each other. Back then we didn’t eat gluten free so I made it as written, and it quickly became a favorite – especially during the summer. Fast forward several years and my husband was diagnosed with multiple food allergies. This was one of his favorites, so it was one of the first recipes I adapted to fit his dietary needs. It has remained a favorite, and we still make it often. 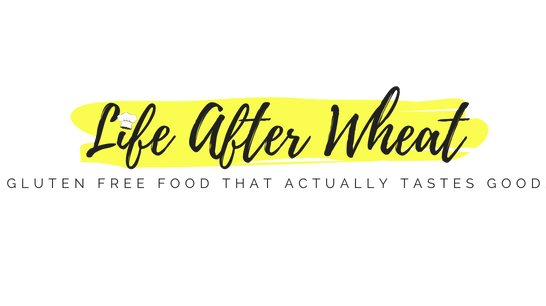 I love that it is also a favorite of so many readers on the Life After Wheat blog, and I hope that you enjoy it as much as we have. Blending the zucchini gives the bread an incredibly moist flavor that you can’t achieve any other way. plus, who has time for grating zucchini anyway? I’ve used a variety of flours with great success, so grab whatever you have on hand and bake up a batch of Blender Zucchini Bread today! NOTE: For this recipe I do not recommend GF Jules (although I normally LOVE this flour) or Namaste flours. ps my gluten free flour mix also works wonderfully in this recipe. To reduce the fat, you can substitute up to 1/2 cup of the oil with an equal amount of applesauce. You can also substitute brown sugar for half the white sugar. For a heartier option, add some chopped pecans. If you’re a chocolate lover, try the double chocolate option below! One reader made Black Forest zucchini bread by adding 3 T cocoa, 3/4 cup dark chocolate chips, and 1 cup dried cherries. Another baked it in a bundt pan. 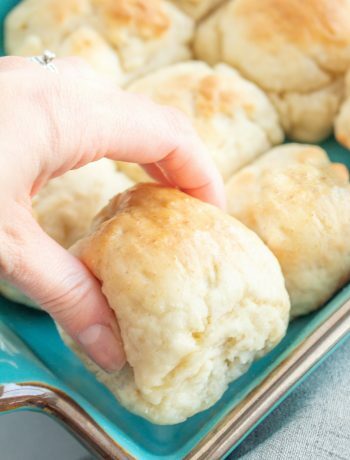 It’s a very versatile recipe and will turn out fantastic any way you make it! Any blender will work, but if you’re looking for a new blender, I LOVE my Blendtec! If you like this recipe, you’ll love my Browned Butter Banana Bread with Maple Glaze! Blend oil, eggs, vanilla and 2 1/2 cups zucchini together in a blender until you have 4 cups mixture. Add more zucchini if needed to reach the 4 cups. Spray loaf pans (8 mini or 2 regular, or any combination) fairly heavily with cooking spray, or grease generously with oil. Bake large loaves for 35-40 minutes, mini loaves 17-22 minutes, until toothpick inserted in center comes out clean. Be careful not to over bake, as they could become dry. Store in plastic bags in fridge up to 7 days, counter up to 4. or wrap in foil and place in freezer bag and freeze. Thaw at room temperature, in the fridge, or in 325 degree oven until warm. This is a blender recipe so it’s super easy (no grating!) The batter gets fairly thick so I use my Ninja, Thanks for asking, I fixed the recipe so it’s a little clearer. I love showing gluten-eaters how great gluten free can taste! Thanks for sharing Judy! Best GF recipe I’ve made. I added a bit of chia seeds to it and loved it. Great idea, Hope. Thanks for stopping by! Yum!! 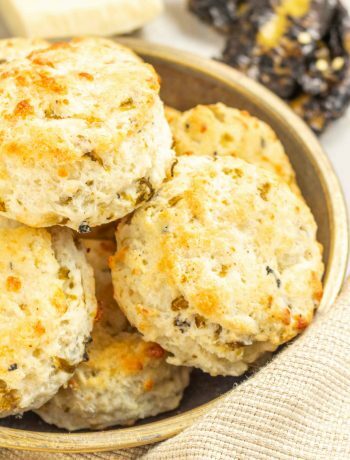 It’s not very often that I run across a gluten free recipe that I deem a keeper – this one has made the cut. I made two batches of mini loaves for the freezer to share with family that will be visiting. Thanks for the recipe! This recipe is definitely a keeper Regina! Thanks for stopping by! Tasty! Will definitely make again. I used the chocolate version and my own flour blend from America’s Test Kitchen cookbook. Has brown rice, white rice, sweet rice , tapioca flours and xanthan gum. Perfect! Thanks for stopping by and letting us know what flour mix worked for you Rebecca! I’ve never tried an egg substitute Andrea, but I would assume you could use EnerG Egg Replacer or flax. Can you use coconut oil or another healthier oil in place of canola oil? Grapeseed oil works great and is a healthy oil. I haven’t tried coconut oil yet but if you do, let us know how it goes! Thanks for stopping by Debi! Would butter or olive oil work as a replacement for canola? I don’t have any on hand. I’ve tried olive oil, but only as a partial substitution because of its strong taste. I would grab some canola or grapeseed oil, or go half melted butter and half olive. Happy Gluten Free Baking Patrice! I’m sorry but this bread did NOT turn out at all. I just spent 3 hours trying to make this recipe and it absolutely would not cook in the middle. I baked the 2 loaves separately, then when it didn’t cook through, I tried cooking longer, adjusting the oven temp, cutting each loaf in half and cooking in 2 separate pieces… I now have the remaining 10 broken up pieces on a cookie sheet trying to salvage what’s left. The outside tastes great, but the recipe is no good if it’s so dense it can’t bake right. I have used this oven for 4 years and have never had this problem. I’m so sorry it didn’t turn out! What kind of flour mix did you use? Costco, which I use for all my baking. This happened to me as well. What was cooked tasted great but had to throw out because it was still raw after cooking for almost 2 hours!!! MAYBE…just maybe your oven temp is off by 15-20 degrees. 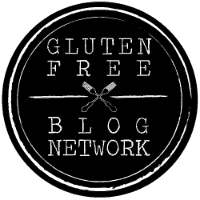 It happens over time and it doesn’t show up in much of our cooking but I’ve found these gluten free recipes can be a bit finicky. Everyone who has an oven 8 yrs. old or more should buy a over thermometer at Wal Mart. I know….I didn’t think mine was off either but it was! AN, I wonder if there is a trend here…I’ve been using Namaste blend and most of my baked goods, quick breads, etc do not turn out. I had a lovely apple cake that appeared to be done and then almost became glop in the middle (raw dough texture) as it cooled. Almost like the cakes will fall as they cool. I am thinking to move from Namaste to some other blends to see if that blend just might be TOO dense. Hmmmmm,. I have used Namaste for quite a few recipes and honestly, it isn’t great as a 1:1 substitute. It’s more like baking with whole wheat flour. 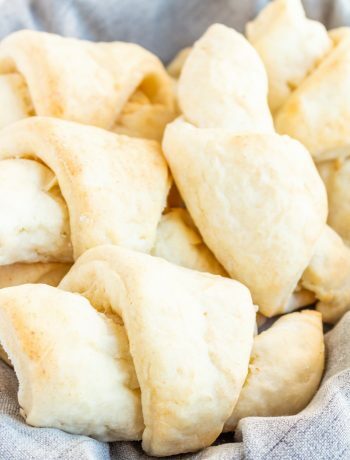 In my opinion, it’s better in breads and other baked goods that would work with a whole grain flour, and even then I usually reduce the amount of flour. Hope that helps. Made the bread today and it was the easiest recipe I have made. I loved that you are able to mix everything in the blender. It turned out so moist! You could not tell it was gf. My husband who doesn’t have to eat gf but does for me said it was amazing!! I will definitely add this recipe to my favorite list. I look forward to trying more of your recipes. I used cup 4 cup gf flour. The texture was great, not gritty at all. The bread browned and rose nicely like gluten bread. Amazing!!! Thanks for coming back to comment and let us know what flour you used Julie, so glad you and your hubby loved it! Beautiful photography and the bread looks amazing. I can’t wait to give this recipe a try! Thanks so much Bren, you’ll love it! I shredded the zucchini and then pulsed it in the food processor. I then combined all the ingredients in the upright mixer. I also did not have canola oil and used grape seed oil. I added a cup of walnuts too. I put the batter in three 3.5″ X 8″ tins and baked them for 40 mins. at 350 degrees. I had to keep checking the batter with a toothpick to make sure it came out clean and they were done. You may need more or less time depending on your oven. I found this bread to be great–very moist and very good tasting. Thanks for sharing! Thanks for sharing how you made the muffins, I LOVE the addition of walnuts…yum! Delicious bread recipe! I will definitely prepare it soon! Thanks Agness, let me know how you like it! This is soo delicious. I replaced the canola with avacado oil and for the sugar I used 1/2 coconut sugar and 1/2 turbinado sugar. EVERYONE LOVED it!!! Even my picky “we hate anything GF” peeps. Do I have to use the xanthanew gum if my flour already has it in it! I don’t really like tonuse this ingredient. Ha, I didn’t even notice 🙂 Let me know how it goes, hope you enjoy it! Hi! I am going to try this recipe now. Looks good. Can I store a batch in the freezer for future use? I usually have batches of chocolate chip cookies etc. that I freeze. Its convenient when you have three kids to feed! This came out phenomenal! I did the whole batch plain , Poured half of it into a loaf pan and then to the remaining batter added cocoa powder, chocolate chips and made the second one, the chocolate version! Super moist and I’m so excited to have tried this recipe! Can I use almond flour instead of a gf all purpose flour? And do I need to still add the xanthan gum to the almond flour? Also, I would like to add banana, would that be ok? I love this recipe! i used coconut oil, and it turned out great. Easy to make too:) will make again soon! Can I use coconut or almond flour? No, coconut and almond flour function very differently than an all-purpose blend. What would happen if I didn’t make it gf, & used something like white whole wheat flour instead? I love the thought of making the whole thing in the blender!! 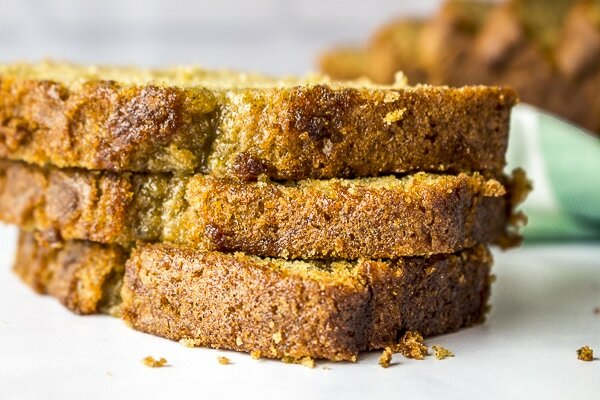 Your recipe is amazingly simple using the blender is the key to this moist, tender and deliciously tasting zucchini bread I have had in 30 years, Thank you!?? I am so glad it is zucchini season again. This bread looks delicious. I love finding ways to sneak in extra veggies. I love that this is made in a blender. I bet that makes cleanup so much faster.